George Martin was born in 1815, in Middlebury, Vermont, and completed all of his pre-law education in that city, graduating from Middlebury College when he was only 18 years old. He studied law with his uncle, Harvey Bell of Montpelier and with Daniel P. Thompson, the well-known lawyer-novelist. About 1837, he moved to Grand Rapids, Michigan where he practiced law and lived for the rest of his life. In addition to his practice, Martin served in public office for several years, notably as Justice of the Peace. It is reported that he also sold insurance and real estate. In his early years, Martin established a statewide reputation as an equity practitioner. In 1848, he was elected Kent County judge, holding this office until 1851 when he was appointed to the Kent County (Sixth) Circuit judgeship by Governor Barry to fill a vacancy caused by the death of Judge Edward Mundy. Martin was elected to a new six year term gaining “a very handsome majority, although the circuit was at that time very strongly Democratic.” As Circuit Judge he was member of the Michigan Supreme Court, holding this position until his death 16 years later. 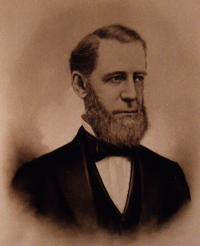 At the time of the reorganization of the Michigan Supreme Court in 1857, Judge Martin became the first Chief Justice. He was held in such high esteem by his colleagues that he remained as Chief Justice until he died on December 15, 1867. He was succeeded as Chief Justice by the Thomas M. Cooley.